As the Public Relations Coordinator for Anchorage Animal Care and Control (AACC), Laura Atwood engages with the Anchorage community every day, whether through social media, shelter tours, school presentations or press interviews. 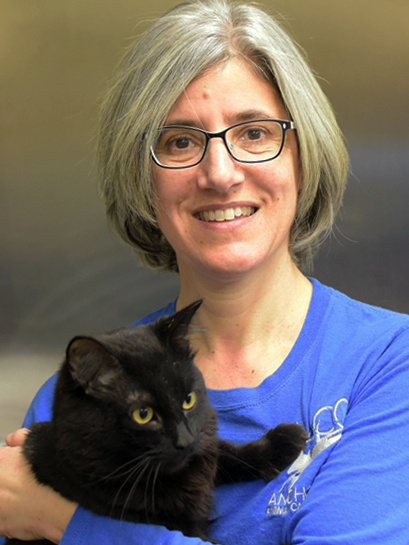 Since starting at AACC in 2014, her goal has been to change the perception of Anchorage’s open-admission animal shelter from “the pound” to a safe haven where temporarily homeless animals are cared for by compassionate staff and volunteers while maintaining public safety as a top priority. She draws on her professional experience in marketing and forming community partnerships to achieve this goal. When not working, Laura spends time with her adopted pack, Whisper, an Alaskan husky that accompanies her on school visits and shelter tours; Piper, a Rottweiler that competes in canine nose work and is training for agility competition; and an orange tabby cat named Petunia that knows a few tricks. Laura also enjoys photography and gardening, and volunteers for Rottweiler Rescue Los Angeles as its social media manager. Laura requests that luncheon attendees write down and bring with them three to five words or phrases that come to mind when you think of a municipal animal shelter.